selected and introduced by Constantin Roman. 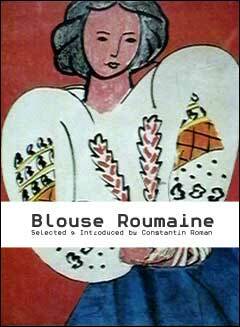 By painting La Blouse Roumaine Henri Matisse gave it artistic perenity and International recognition. Indeed the painting, which is now in the Musee dArt Moderne in Paris, had become an icon of Romanianness and in particular of Romanian feminity. So, why a Romanian Blouse, out of the blue? Looking at some of Matissess earlier works one could discern the idea in the blouse of the 1939 dancer Une danseuse en repos, showing a seated woman wearing a Romanian blouse. Likewise, another of Matisses paintings, Still Life with sleeping woman , now in the collection of the National Gallery of Art, Washington DC . The sitter is a woman wearing an embroidered long-sleeve blouse, decorated on the upper part of the sleeve similarly to the Romanian blouses. An even earlier version, with prevailing greens appearsi n 1937. So, from these and other examples, one could suggest unequivocally, that the idea was not new in the artists mind. However, what was new on this occasion, in 1940, was that the ROMANIAN BLOUSE had become central to the subject, forcing it on front stage and giving it a specific, named identity. The canvass must have been discussed, if not prompted by the visit of an old friend the Romanian painter Theodor Pallady (1871-1956), whose portrait was sketched by Matisse, in Nice, in 1940 (see John Klein, Matisse Portraits, pp137). The firendhip between Matisse and the Romanian Pallady went back to their time together at the Ecole des Beaux Arts in Paris (1891-1900). Throughout their long correspondence a close affinity developed between the French and the Romanian painter. Quite apart from the closeness in style and demeanour, the two friends shared a great many complicities, amongst which the image of Romanian muses, much in view in 20th century France, was a recurring subject. In his correspondence, Matisse would accompany his letters by sketches and would use Pallady as a sounding board, sometimes talking about his artistic and personal anxieties. In this context, the theme of the Romanian Blouse becomes more significant. It was painted in 1940, during one of the darkest periods of the war, which the country had experienced under Nazi occupation. Matisse was soon going to abandon Nice, which was being bombed by German planes, for the relative security of the arriere-pays, in Vence. Reading some of the artists diaries of that period one could detect that the cheerfulness of the Romanian Blouse was acting like an antidote, as it represented a glimmer of optimism and of hope. What does the artist say? Helene Vacaresco, whose love poems were sung by Tino Rossi (Si tu voulais) and her love life inspired Pierre Lotis best selling novel LExilee and gave the name to a prestigious literary prize ; Le Prix Vacaresco-Femina (now known as the Prix Femina). Or the much lionised Comtesse de Noailles, nee Princess Brancovan, the first woman to become a Commander of the Legion dHonneur. Anne de Noailless poems were awarded the first Prize of the Academie Francaise, at the turn of the century. Or her cousin, the Parnassian poetess and hostess Marthe Bibesco, who inspired Marcel Proust, Cocteau, Paul Valery and DAnunzio and who attracted to her entourage all the contemporary names that mattered, with the zest of a consumate entomologist, who would pin coleopterans in his prized cabinet. Doubtless the Lost paradise was the object of much anxiety for Matisse and his bringing back to life the memory of these etheral Romanian muses in the form of the Blouse Roumaine was an act of faith. The war was going to put an end to this fertile liaison between Romania and the Paris Literary and artistic circles as the natural link between Romania and the West was fractured by the Iron Courtain. Now the country was going to live ,for five decades, the dark ages of ideological censorship, enprisonment and extermination. like some interminable genetic experiment of Kafkaesque proportions. With it, for nearly half a century the spirit of the Blouse Roumaine suffered a long period of eclipse, but survived to tell the story: these are the voices of Romanian women, which we bring about in this Anthology  some famous, other infamous, and most of them with the unconscious freshness of the unknown heroines  simple peasant farmers who languished in Siberian camps, pastors wives who suffered for their religious beliefs, self-efacing vives who were sent to concentration camps to expiate the politics of their husbands, or for no other sin than for having edited their spouses work  women, who in the normal course of events would have passed through life unnoticed, but whose torment under a genocidal regime, brought them to the fore of their countrys consciousness, for their bravery, their lyrical expression of their suffering, women who fought in the maquis and had to be buried under an assumed name, many others whose bodies were thrown in an unmarked, common grave  The names of these heroines are countless but their roll call, deserves our attention. After Ceausescus demise the image of the Blouse Roumaine gradually came back into its own, slowly, like the awakening from a surreal nightmare: is the transition real? Is it for true? Is the past going to repeat itself? It will take a while before the Sleeping Beauty of Matisses canvass will wake up to enchant the world stage, once again. This day will come, but in the meanwhile the princess from the Blouse Roumaine will keep vigil that this dream may come true, like the angel enjoined by the French Master, in his war-time diary..
Constantin Roman © 2001-2002. All Rights Reserved. Designed & Maintained by Delamain Creativity.